In 1876, a German engineer named Nikolaus Otto built a new kind of engine.1 The internal combustion engine didn't need a separate, heavy boiler to burn fuel, as the steam engine did. It burned the fuel inside the engine itself. Engineers could build internal combustion engines that were much lighter and smaller than steam engines. And inventors could fit the new engines to smaller vehicles ... like cars. 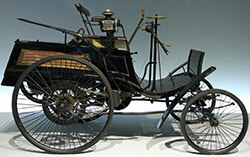 Benz hoped that rich people would buy the Motorwagen, but they didn't think it was reliable. Then his wife Bertha had an idea. She drove the Motorwagen over sixty miles with their two sons on board. The news of the trip spread across Germany, and the Motorwagen became famous. Benz built a factory to make cars that people could buy. So did other inventors. 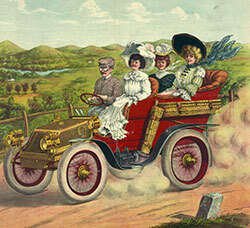 The early cars were expensive and very unreliable. Later on, some companies used the internal combustion engine to make a vehicle for carrying lots of people: the bus. Others used the internal combustion engine in planes. This was the first time a person flew a powered plane anywhere! 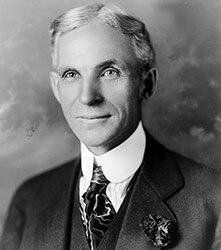 In 1908, an American inventor named Henry Ford created a car he called the Model T. The Model T was more reliable and easier to drive than earlier cars. It was also cheaper. 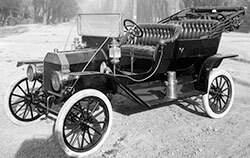 The Model T was so cheap that a Ford worker could buy one with just four months' pay.7 Everyday working people could afford a car of their own. Car sales soared! There weren't many rules about what drivers could do, so traffic was even crazier than it is today. Traffic lights were new, and many drivers ignored them.10 Instead, they all tried to cross busy intersections at the same time! There were accidents and traffic jams, but people still wanted cars anyway. Cars changed the way America grew. People didn't have to live close to their jobs anymore; they could buy houses far away, and travel to work by car. Developers built sprawling suburbs of tract houses, and shopping malls with thousands of parking spaces. In the 1930s, the government started building special roads just for cars: freeways! 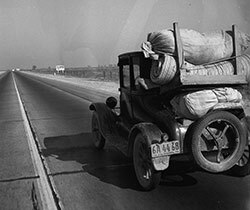 Soon cities like Los Angeles had miles and miles of freeways. Cars could go faster than ever. 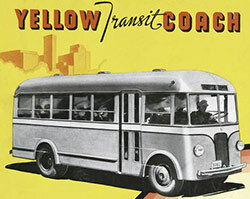 In the 1930s, a businessman named Roy Fitzgerald started buying up city rail systems and turning them into bus lines. Riders would step off a streetcar one day, and climb on a new bus the next day.12 Sometimes, the streetcar tracks were torn up overnight. Roy Fitzgerald's companies replaced streetcar lines in dozens of cities. In some cities, like Baltimore14 and Los Angeles15, transit would never be the same. But many people didn't care. They didn't have to live in little city houses anymore, or wait for crowded trains or buses. They could live like kings in big houses in the suburbs, and travel whenever they wished. Then cars started causing big problems.